Sandhill Cranes roost in standing water. This crane was roosting in very cold water which froze a layer of ice on it during the night. 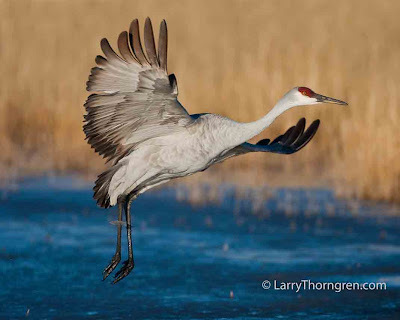 The crane lifted its legs out of the ice and took flight. There is a ring of ice still attached to each of its' legs. Very nice shot, and amazing it can stand that.